Saturday January 19th 2019 at 08.00pm at the Magazzino Vault, Valletta Waterfront. A social event with a speaker in association with Rotary Club La Valette. The talk will be preceded by a reception at 7pm. The Annual General Meeting of the Club will be held on Monday 26th November at the Corinthia San Gorg. Drinks at 7.00pm and meeting starts at 7.30pm. Agenda and minutes will be circulated latter. Please note the nomination form for election to the Board will be sent out shortly. Nominations should reach the Secretary by not later than 19.00 hours on Monday 25th November. Mr Meli will discuss how agricultural products such as pesticides and fertilisers, should be used to get the best outcome but avoiding harming the soil, groundwater, environment and ultimately our wellbeing and health. The CIP 2018 Meeting is being held in Brunnen, Switzerland between the 27th and 30th of September 2018. This is a fellowship meeting between Italian,Sicilian,Maltese,Swiss and Liechtenstein Rotarians yearly in a different country in one of the participating countries.The meeting will be held in Malta next year. Pictures that were taken during the evening at the Gala Dinner on May 26th can now be viewed in the Rotary Photo Gallery which can be accessed at the top in the Home page. Members were sent an e mail on May 24th 2018 outlining the GDPR procedures that are required by Rotary Club Malta to send to members. You are kindly asked to read the email in your inbox and reply. Lino Cutajar wrote a book to celebrate the 50th Anniversary of Rotary in Malta. It is a 32 page book all illustrated with philatelic images and the booklet is being offered free to Rotary members, so long as supplies last. 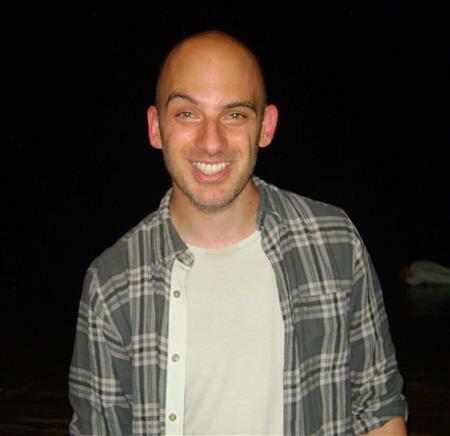 Nathan Adams, District 7070’s 2016-2017 inbound Global Grant Scholar from District 2110 in Malta, is now a Project Officer at the United Nations Association in Canada (UNA-Canada). Nathan helps facilitate the newly launched UNA-Canada Green Spaces student employment programme, which is designed to provide talented students (aged 15-30) with engaging summer work opportunities in parks and natural settings across Canada. On Saturday 5th May 2018, Governor John Degiorgio will be holding a training session for New & Prospective Members. Apart from prospective members, this training is meant for members who have joined Rotary in recent years and others who may wish to know more about Rotary. This will be held at the Old University Building in Valletta, entrance from Merchants Street, starting at 9:30 and should be over by 1:00pm. The training session is free of charge. Please book by sending an email to our Club Secretary, Tonio Cuschieri at tonio.cuschieri@gmail.com. An article written, by Robert Von Brockdorff appeared in the Sunday Times on March 4th. It was entitled " 50 years of Rotary in Malta"
Emperor of India, Triq Elija Zammit, St. Julians. 7.30pm. Meal starts at 8pm. There is a small car park in the vicinity. Members could also park at the Eden Car Park next to the cinema, where there is a lift that takes you up to the street directly in front of the restaurant in Triq Elija Zammit. Members are advised to book early as seats are limited to 20 persons. 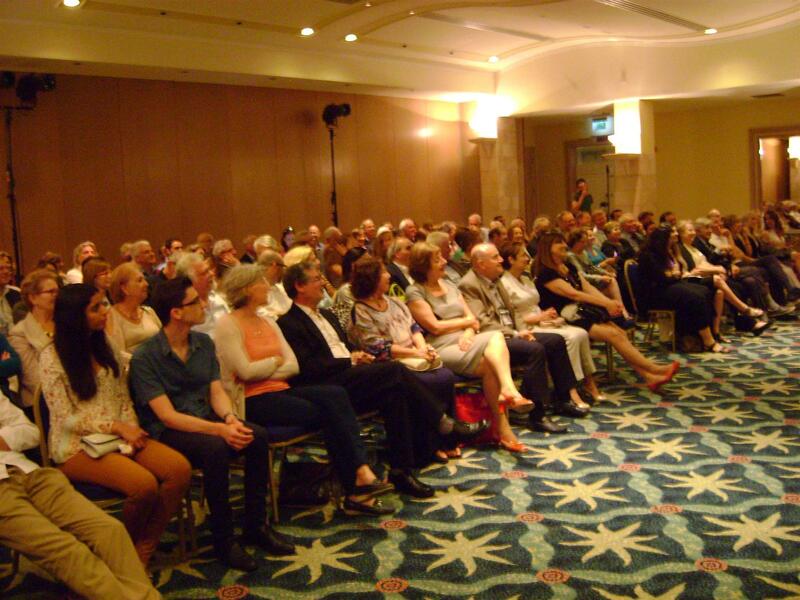 Rotary Club Malta started a new chapter yesterday with the induction of our first female member into the Club. Sue Simons, an ex-Rotaractor whose late father was an English Rotarian, was officially inducted into Rotary Club Malta on the 29 January by President Robert Ghirlando in the presence of District Governor 2017/18, John de Giorgio. Members of Rotary Club Malta and Rotary Club La Vallette attended a tree planting ceremony on Tuesday 21st November at Bahar ic-Caghaq. Between them the two clubs sponsored 355 trees, of which 270 were planted at Bahar ic-Caghaq and 65 at Swatar. On Saturday November 25th Rotary Club members and friends had a "Hands on Day" at Inspire where they carried out painting as well as some clearing work at the Charity Shop area. Our thanks go to Ueli Barfuss who provided the drinks for all the helpers. This is an annual event that offers experience in leadership to young persons. Leadership is a fundamental quality and a necessary requirement in anyone’s personal and professional life. Our Rotary District organizes a RYLA seminar every year as a service to the community from which young persons can benefit. The event will take place in Malta from the 19th to the 23rd March 2018 and its main theme will be “Leadership and Motivation”. Rotarians and guests celebrated 50 years since the clubs inauguration on October 6th 1967, the event being held at Dar Il-Kaptan. The President, Robert Ghirlando, in his speech gave a review of the club achievements since its inception up to the present day. 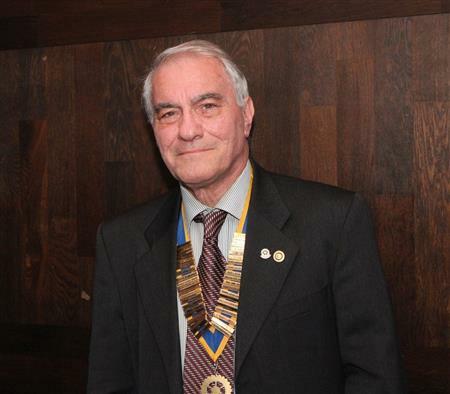 Past President (2016/7) Rotary Club Malta; Member of the Philatelic Society of Malta; Medical Philately Group (UK) and the American Topic Association. 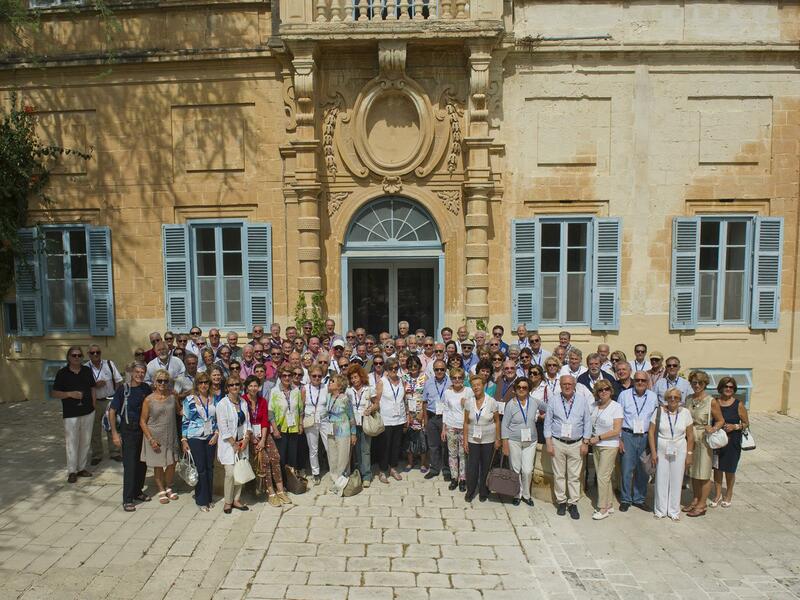 Rotary Club Malta was again represented at the Comitato Interpaese Meeting in Italy between the 21st & 24th September held at Mesagne in the Puglia region. As we arrived at Bari airport where Rtn.Simon Bonello drove us to the venue at Mesagne and safely back for our return flight to Malta. We were lodged in a very comfortable hotel that provided excellent meals besides us attending a concert of young musicians who presented a repertoire of popular music at the gala dinner. Another evening we were presented with a display of regional folk dancers.We were taken on tour to the lovely Baroque town of Lecce besides other neighbouring towns. The group was made up of PDG Alfred Mangion, Simon and Lydia Bonello, Joe Aquilina and Stephanie Frendo and Rob and Liz von Brockdorff. 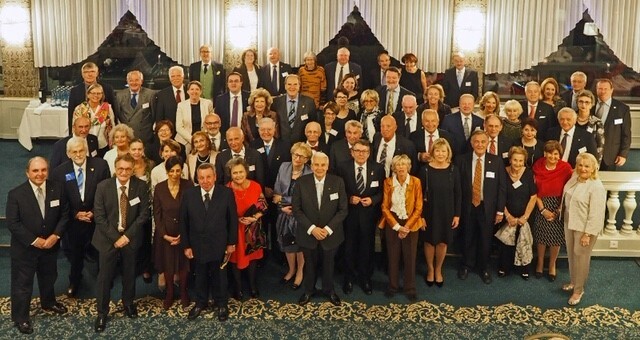 The scope of this annual meeting held either in Italy,Switzerland,Liechtenstein and Malta is a fellowship meeting where a large percentage of the participants are repeaters.The official language spoken is Italian although several of the participants speak English. The venue for next year's meeting is Switzerland and in 2019 the meeting will again be held in Malta . An effort is being made for next year's meeting to attract new participants and some younger Rotarians. Let us be represented by a larger group next year. Although the Constitution of Malta does not expressly refer to the doctrine of the rule of law, it is embedded within it. The rule or supremacy of law in its present formulation gained currency through the work of Albert Venn Dicey’s An Introduction to the Study of the Law of the Constitution. Joseph Raz holds that the rule of law in its contemporary formulation means that ‘people should obey the law and be ruled by it’. But, more specifically, it means that the government is ruled by the law and is subject to it. Considering Malta, it is clear that a constitutional tenant is that the rule of law is fundamental to the governance of the state and that the rule of law can be implied from a reading of the Constitution’s provisions, not because the Constitution, by express words, states so but because this can be deduced by necessary intendment. For instance, the Judicial Committee of the Privy Council has held, with regard to similar Westminster Constitutions like the Maltese, that Westminster Constitutions are based on the rule of law. Kevin Aquilina is the Dean of the Faculty of Laws at the University of Malta where he is also Head of the Department of Media, Communications and Technology Law. He holds a doctorate of philosophy in law (Ph.D.) from the London School of Economics and Political Science of the University of London, a doctorate in law from the University of Malta (LL.D.) and a Masters in International Maritime Law from the International Maritime Organization’s International Maritime Law Institute (LL.M.). He currently lectures on the Maltese Legal System at the Faculty of Laws of the University of Malta. Professor Aquilina has held the office of Director General Courts and subsequently Chief Executive of the Maltese audiovisual broadcasting regulator – the Broadcasting Authority – for over ten years and has drafted all broadcasting legislation between 1999 to 2013. He attended several conferences abroad related to broadcasting and presented also papers at such conferences including those organised by the European Platform of Regulatory Authorities (EPRA), the Mediterranean Network of Regulatory Authority (MNRA) and the International Association of IT Lawyers. He also served as Chairman of the Press Ethics Commission – the self-regulatory media body which hears and decides complaints against journalists. In the realm of Administrative Law, Professor Aquilina served for eleven years as Chairman of the Planning Appeals Board, and subsequently as Legal Advisor to the Planning Appeals Board and Member of the Environment and Planning Review Tribunal. Professor Aquilina has authored various books, written several reports for Maltese and foreign institutions, drafted many primary and subsidiary laws and has published papers in edited books and articles in peer reviewed journals apart from various contributions to the print, broadcasting and new media. A Rotary Community Corps is a group of people who share the Rotary ideals and commitment to changing the world through service projects. Rotary Community Corps members plan and carry out projects in their communities and support local Rotary club projects but are not members of a Rotary club. On the initiative of Monique Chambers, a group of 10 non-Rotarians have come together to form a Rotary Community Corps (RCC) sponsored by our club. The Rotary Clubs of the Maltese Islands have jointly issued a call for applications to residents of Malta for a Rotary Scholarship worth $30,000 for international, post-graduate studies during the academic year 2018-2019. This scholarship is one of the most generous scholarships available in Malta. Closing Date: 10 September 2017. On Monday July 10th at the Palace Hotel, Sliema the retiring President Prof. Carmel Lino Cutajar handed over the chain of office to Robert Ghirlando. Many Rotary members and guests attended the Handover Dinner and during the evening Lino Cutajar outlined his year of office and the achievements of Rotary, including the Gala Dinner where a sum was collected for the Children's Ambulance run in conjunction the Malta Red Cross. He out lined other events in the year of his office and thanked all the members for making his year in office a memorable one. 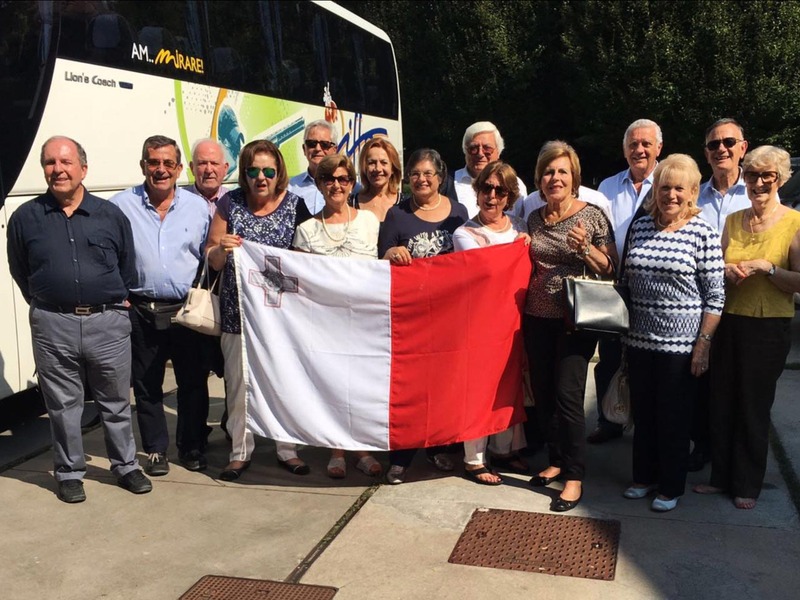 A party of Rotary members from Malta including wives, left on Friday June 23rd for Catania and onwards to the Santa Tecla Palace Hotel, a seaside hotel, in limits of Acireale. On Saturday June 24th John de Giorgio was cheered in as the new District Governor 2017-2018. In John's brief address he thanked those present and particularly the Maltese contingent for their presence in such numbers. He said he would be dedicating his year in honour of his father Roger, who was a fervent Rotarian and who contributed to the founding of the Malta club some fifty years ago, as well to all Rotarians in Malta. His intentions for his year in office will be to honour the presence of Rotary and its members in the Maltese archipelago. The Children’s ambulance, the major project of Rotary Club Malta for the year 2016/17 was officially presented to Malta Red Cross by our President Lino Cutajar. Members of Rotary as well as mothers and children and the local press were present at the handover at the Operations Centre of the Red Cross in Pembroke. Pictures of the event can be found by going to the Rotary Photo Gallery. A year has flown by and I am about to write my last letter as Governor for District 2110. I sincerely hope that I have not been too tedious with my reflections and suggestions, but as you all know, entertaining you with the monthly Rotarian theme is one of my duties. This month we shall look at Rotary Foundation and Rotarian Circles. In 1917, at the International Congress of Atlanta, with his idea of setting up a fund ‘to do good to the world’, Arch Klumph planted the seed that grew into the Rotary Foundation. Thanks to his vision and to the untiring efforts and the extraordinary generosity of Rotarians in the World, that fund has developed into one of the most important humanitarian foundations of the planet. That idea and the initial contribution of $26.50 sparked off a power that has seen works of solidarity modifying the life of millions by improving the living conditions of various communities. As this Rotarian Year comes to an end, RF celebrates its 100th birthday. 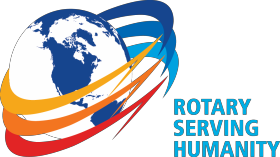 It has been a century in which Rotarians have been involved in extraordinary activities, placing themselves voluntarily at the service of humanity each contributing with their own professional abilities and using their personal contacts. Since its foundation, Rotary Foundation has invested 3 Billion dollars in sustainable projects with the aim of providing clean water, fighting disease, promoting peace, providing basic instruction and making an effort in developing local economies. Furthermore, in the last thirty years, we are in the forefront in the effort to eradicate Polio from the World. Rotarians return to Atlanta from all over the World to celebrate this prestigious anniversary, the Centenary of the Rotary Foundation. It is the perfect occasion to globally share the worthy results and to make sure that all Rotarians and every member of the world communities be aware of the actions accomplished by Rotary and its Foundation. This achievement deserves to be celebrated. Rotarians have set themselves a precise objective, the collection of 300 million dollars during the centenary year. Our donations will allow the Foundation to have a stronger impact during the second centenary of its activities. Rotarian Circles, known as Rotary Fellowship, are autonomous social groups made up of people who share common passions. Partaking in these fellowships is an enjoyable way of making friends with people from all over the world as well as discovering different ways of “being Rotarians”. Several Fellowships were created and they have grown in number in recent years, creating wide programmes based on two fundamental factors: Organising events for members such as bicycle or skiing races, motorcycle excursions, sailing regattas, etc. ; creating events to support organizations in aid of the less fortunate groups of people. 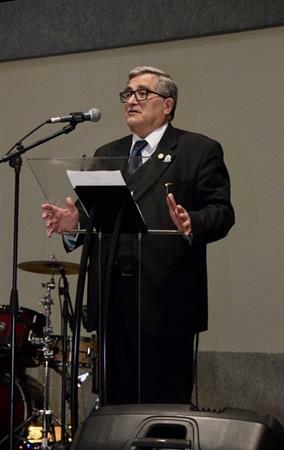 The President of Rotary Club Malta Carmel Lino Cutajar presided over this annual event held at the InterContinental Arena Conference Centre, St Julian's. A presentation was made to the Malta Red Cross of a children's ambulance made possible from funds and contributions from the evening. Frank Salt Real Estate, Mediterranean Bank, Quick Lets. which grows when we share it. 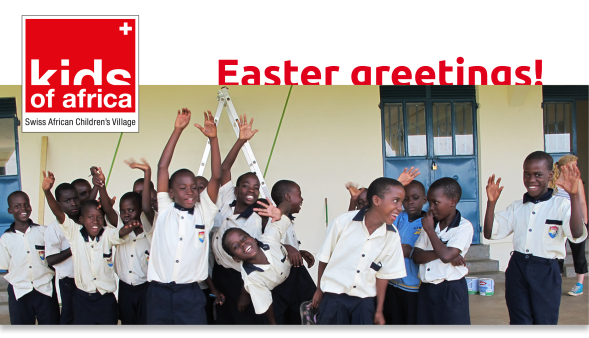 Easter is approaching and is celebrated by christians in Africa just like in every other country. Easter not only speaks about resurrection and freedom, but also about our responsibility for the world we share. Kids of Africa, too, seeks to assume its share of this responsibility. Because every day, more than 3’000 impoverished people are fleeing from South-Sudan across the Ugandan border. When we travelled to some of these desperate communities, we decided to plant a mustard-seed of hope, especially for the next generation. Because education and sustainable farming practices could save many lives and prevent famine and migration. That’s why we chose to develop satellite project in this fragile region. Together with a hopeful village-community, who lost 57 lives when ambushed by bandits some years ago, we want to open a new chapter. Your support remains vital to this. The gratitude it earns goes beyond these lines. To see how it works, watch this short explanation, offered by one of our fosterlings. A final wish: might you recommend Kids of Africa to somebody you know? Here you can subscribe our regular newsletter with a personal message. Thank you! 100% of what you donate goes directly to the project. Any fundraising costs are covered by the Kids of Africa board members. Möchten Sie die Sprachwahl korrigieren? Proposed program of a visit to celebrate the appointment of a 5th Rotary District Maltese Governor John De Giorgio. Malta area has been awarded the Global Grant Scholarship in the name of our preferred applicant Dr. Andrea Debono Sant Cassia. 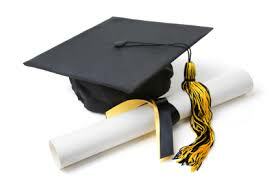 Andrea will read an LLM ( Masters of Law) in Human Rights and Humanitarian Law at the University of Essex. 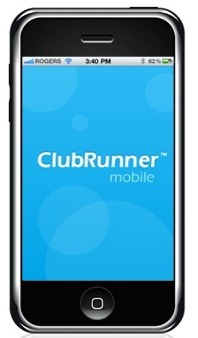 We're very excited to announce that the ClubRunner Mobile App is available for download! The ClubRunner Mobile App is your key to connect to your ClubRunner website on the go! Completely, free to download and use, this app will let you access the key info you need while you're on the go. Password protected just like your website, the ClubRunner Mobile app allows you to to view your member directory, contact your members and executives, read the latest articles posted to your website, and even learn more about your upcoming events and speakers, right from your smartphone or tablet! To download the app from the Apple App Store or from Google Play, simply type in 'ClubRunner' in the search bar. Our mobile app is compatible with all versions of the iPhone, iPad and iPod Touch sets that have iOS 8.0 or later and with versions of Anrdoids that are 4.0.3 or better. Rotary’s International Assembly in San Diego, California, USA. Rotary International President-elect Ian H.S. 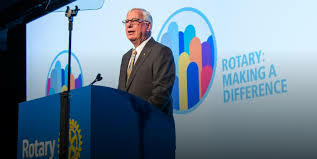 Riseley made the case that protecting the environment and curbing climate change are essential to Rotary’s goal of sustainable service. I am very fond of writing Christmas cards.It is said that they are slowly going out of fashion due to the omnipresence of digital communication.To date I have sent some 130 cards (60 abroad).I still find it a most edifying exercise as it makes me pause and think about my friends and family. It is in this spirit that I am now writing these few words to you dear Rotarian friends. District has published what should be a very interesting and colourful book, to which the three local Maltese clubs have contributed and it has Italian and Maltese texts. The book is priced at only €15 and we have ordered 50 copies. Rotarians, Rotary clubs and districts plus Rotary supporters from throughout the world have responded with messages of support and donations to aid Rotary Italy to assist the communities of Marche, Umbria, Abruzzo and Molise to recover from the devastating earthquakes earlier this year. Rotary Club Malta are asking you to make a donation which will, in some way, assist the communities that were hit by these earthquakes. Talk by Simon Bonello on the Foundation and the students from Malta. Simon gave a very detailed account on how the Foundation was started and introduced the 3 students who gave accounts of their achievements. Quite apart from our club’s activities and occasional District news we don’t often talk about what part Rotary International plays in the world. A Hundred Years of Rotary Foundation calls for some celebration particularly because our Malta clubs are direct recipients of the good this important wing of Rotary dispels. In 1917 Arch Klumph had this idea of an endowment fund dedicated to Doing Good in the World. His vision is today one of the world’s leading humanitarian foundation, thanks to the generosity of Rotary members worldwide, and this is how it all started. 2007 Bill and Melinda Gates Foundation issues a 100 million dollar challenge that Rotary matched in about half the prescribed time. 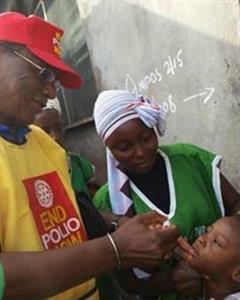 2012 The Gates Foundation participates again in the Polio program with a donation of 350 million conditional of Rotary collecting €200Million. Rotary members have helped immunise more than 2.5 billion children against polio.Today all but 2 countries are free from Polio. In year 2014/15 program awards, that also include PolioPlus partner grants, totaled €123 million dollars. GLOBAL GRANTS sustain large-scale international activities always strictly within Rotary’s six areas of focus. 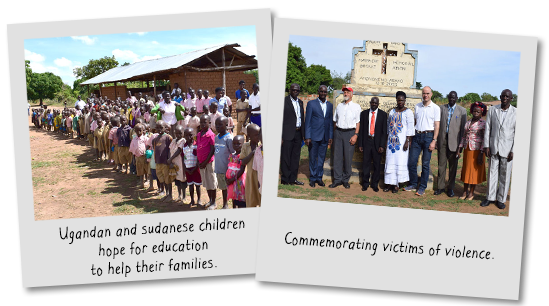 These consist of humanitarian projects, scholarships and vocational training teams. Suffice to say that last year the Foundation approved 1078 global grants and program awards, totaling €64.9 million. Through our contribution each year our club donates an important sum of €5000 to the PolioPlus fund and €8,500 to the Rotary Foundation Annual Fund. From 1970 to 2015 our three clubs in Malta have won 23 Global Grant Scholarships, 10 of which were awarded in these last 10 years. Apart from scholarships, Global Grants also apply to actual projects hosted outside of district, mostly in Africa. Sandra Schembri Wismayer, Samuela Galea,Dr. Roberta Avellino,Nathan Adams. The Rotary Clubs of Malta are pleased to announce the launch of their annual scholarship for international, post-graduate studies which is valued at US$30,000 and open to Maltese residents. The purpose of the Rotary Scholarship is to enable candidates to further their international, post-graduate studies in areas of study which are aligned with the Rotary Foundation's Areas of Focus. The closing date for applications is the 20 December 2016. Make a donation to our charities we support. Dar il-Kaptan celebrate 25 years. The President Lino Cutajar was present on November 11th at the reception to celebrate 25 years of Dar il-Kaptan. 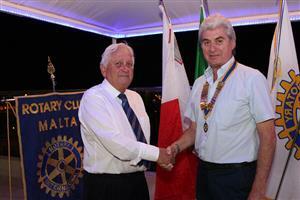 He was joined by Rotary Club Malta President Elect Robert Ghirlando,Secretary Tonio Cushieri and Frank Salt. 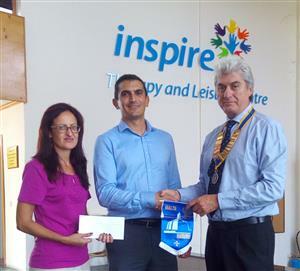 Dar il-Kaptan has been sponsored by Rotary Club Malta. There were 56 members and guests who were enthralled by the first showing of the new Tom Hanks film at the Eden Century Cinema Complex in St Julian's. It was very similar to the last films he has starred in, having an intriguing plot and lots of action. Before the film started there was a pasta dinner with wine. 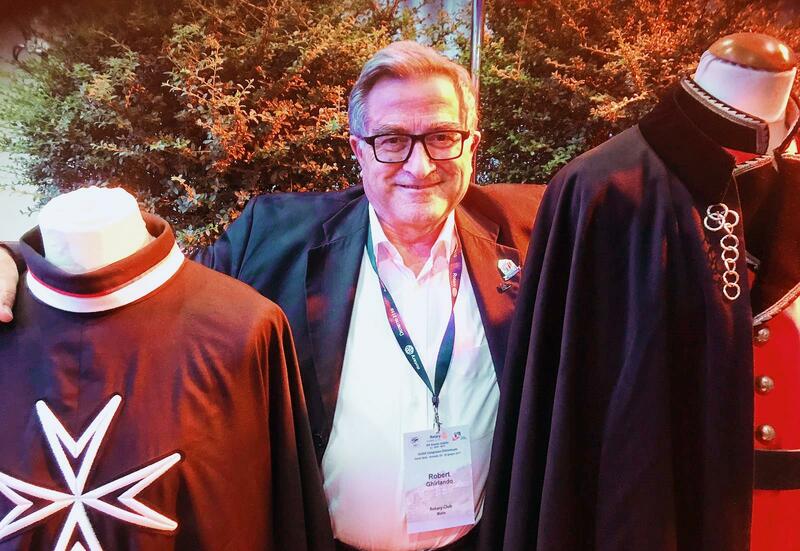 Francesco Arezzo, a Past District Governor of our District, 2110 - Sicily & Malta, has been elected as a Rotary International Board Director, representing Rotarians in Italy and France, for the period 2018-2020. Nine members from Rotary Club Malta attended the CIP Fellowship meeting held at Bra Italy between the 8th and 11th September 2016. As usual our club’s attendance was the largest single club in number of participants attending the weekend. 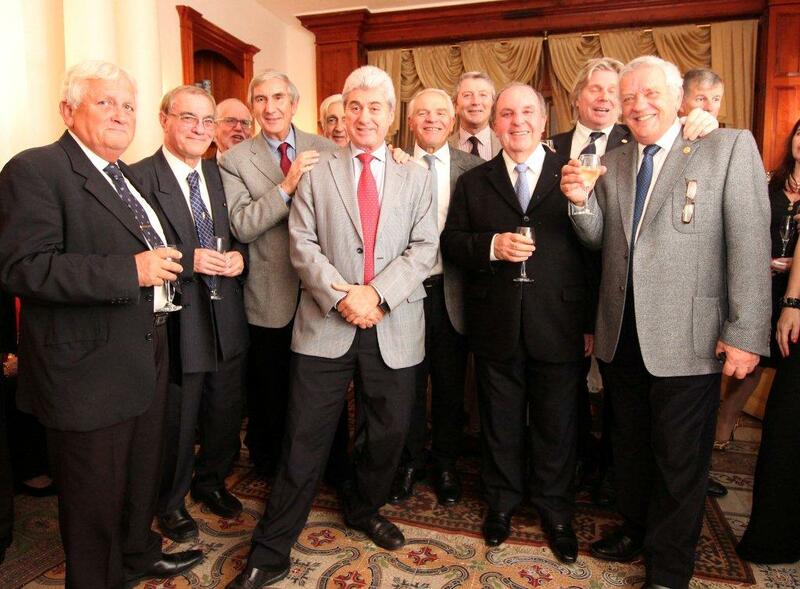 The meeting is a fellowship reunion between Italian,Swiss,Liechtenstein and Maltese Rotarians and wives. Many of the participants attending are repeaters and the languages spoken during the weekend are Italian and English. We were lodged at Albergo Cantina Ascheri in Bra, which is located over a winery on the ground floor and lower cellars. We were hosted to a visit by the owner of the Cantina Ascheri, producing Barolo, Barbaresco and Gavi wines.Christina Ascheri, who is the hotel owner and a Rotarian,was also chairman of the hosting committee. Bra and the surrounding cities are connected with the growing of vines and the production of quality wines.A highlight of our visit was the visit to the Cantina of Fontanafredda which is the largest winery in Italy producing a vast selection of quality wines.We were then dined on the winery grounds in the evening at their five star restaurant. The topic of the speakers on the Saturday morning meeting was food, water and climate of the area we visited. All very interesting subjects that had our full attention. Next year’s meeting will be held in the Puglia area in Italy between the 21st and 24th September 2017, and new participants from the three Maltese Rotary clubs will be most welcome to attend. First of all, I would like to thank the previous board members so ably led by John Cooper. The new board met a few days ago and immediately set about planning a road map for the coming Rotary year.I wish to thank the members for their enthusiasm and support. A few weeks ago I sent a questionnaire to all our members asking for their views on our club.The few who answered were all enthusiastic and found little to question or even suggest. As I had occasion to point out to the new board I am more pragmatic. Our club is an ageing one and this raises serious problems which need to be faced now and solutions found. In an exercise carried out by Secretary Tonio, 65% of our membership is over 65 years. This does not augur well for the future and creates logistic difficulties as well as certain obligations. The most salient logistic consideration is the need to rejuvenate our membership.This demands a concerted effort by all of us. We need to attract associates preferably in their late 40’s and early 50’s (although others are of course not excluded). I shall keep harping on this issue during my presidency as I am truly concerned about the future of our club. The increasing age of our membership has already had a tangible effect: some elderly members have resigned; some have remained active (or partially so). Of more concern are those members who are plagued with illnesses and other personal problems. Our club has certain obligations to these members which hitherto have been largely given little attention. I am therefore proposing a humanitarian approach focussing on the personal needs of our deserving members. 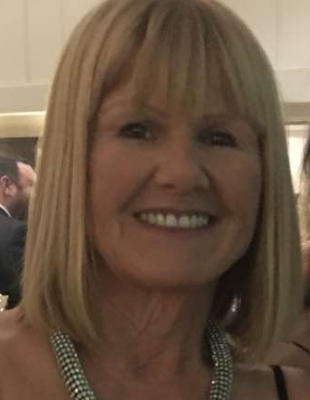 I am appointing a small Club Welfare Team who will monitor our membership especially focussing on health problems (perhaps visits at home or in hospital), family bereavement – and, on a more pleasant level, perhaps sending e-birthday cards.This venture needs the cooperation of all our membership. Anyone who is aware of any of our members who are experiencing personal problems should contact Secretary Tonio who will pass the information to our Welfare Team. I apologise if I sound rather parochial, but these are issues in which I strongly believe for the benefit of our club. I assure you that Rotary Club Malta remains vibrant and strong. I have appointed a number of sub committees (see attached doc) with specific terms of reference.We shall continue with our humanitarian projects. Indeed, at our first board meeting we have already examined a number of projects. I shall keep you updated. We are also exploring a number of social activities and fund- raising events.Unfortunately, the first event, the Kon Tiki boat race had to be postponed because of inclement weather. Ulli has been working non-stop on this event and he deserves all our support. I wish you all a pleasant summer. Remember the Mejda Rotarian. 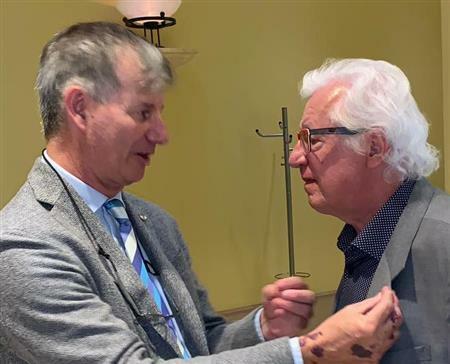 On Monday July 4th at the "Reef Club" the retiring President John Cooper handed over the chains of office to Lino Cutajar. Nearly 100 members and guests attended the Handover Dinner and during the evening John Cooper outlined his year of office and the achievements of Rotary, including the Gala Dinner where a sum of €27,000.00 had been collected for the purchase of a mini van for Caritas. Other events included a successful Hands on Day, and the Dinner for the District Governor and the RI President in November 2015. He thanked all the members for making his year in office a memorable one. 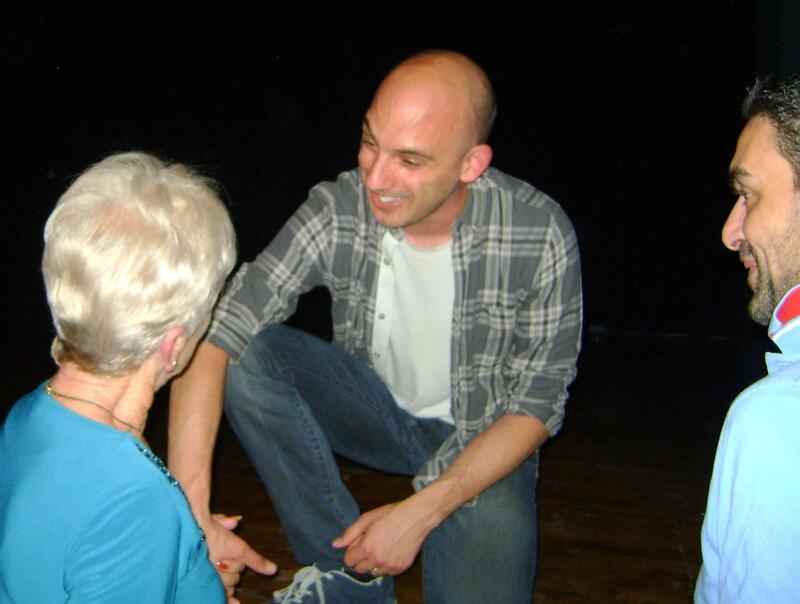 On Monday May 23rd Chris Dingli gave more than 100 members of Rotary and guests a very enjoyable evening with his showing of his one man comedy show entitled "Bad Dad" before he takes it to London. The work of Caritas Malta in respect of the Prison Inmates Programme was clearly outlined by Fleur Bianco to those members of Rotary at the talk, and showed how much the dedication these social workers have in trying to help these individuals. Below is a brief outline of her work at Caritas. Rotary Club Malta recent donated a brand new 9 seater van to Caritas Malta to help them in their work on the PIP programme. 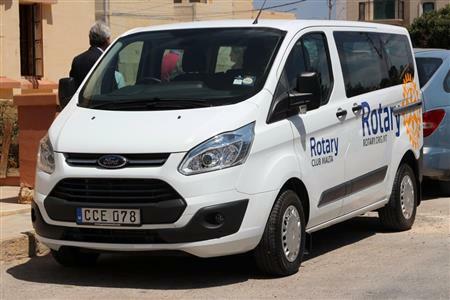 Rotary Club Malta raised all the money for the van at a fund raising dinner held on the 1st April 2016. 9,000 Rotarians from over 80 countries attended a special Jubilee Audience in St. Peter’s Square, Rome on Saturday at the invitation of Pope Francis. A delegation greeted the Pope at the end of the Audience. 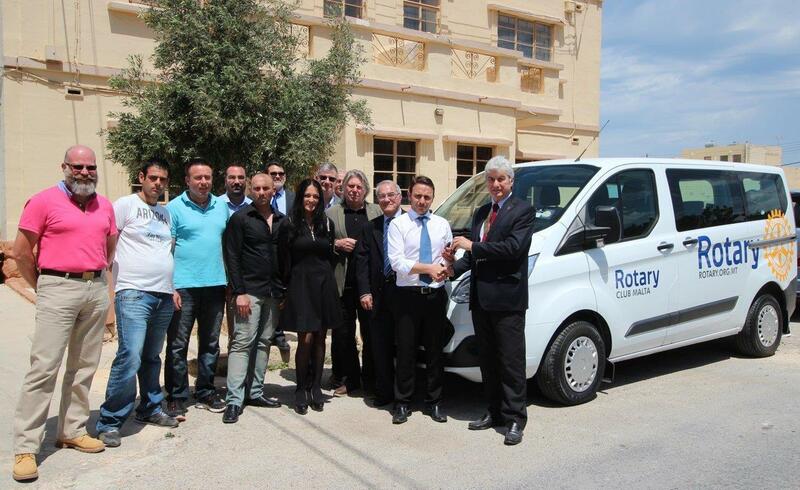 Rotary Club Malta presentation of a minivan to Caritas. The new minivan donated and supported by Rotary Club Malta was presented to Caritas by the President of Rotary Club Malta John Cooper. 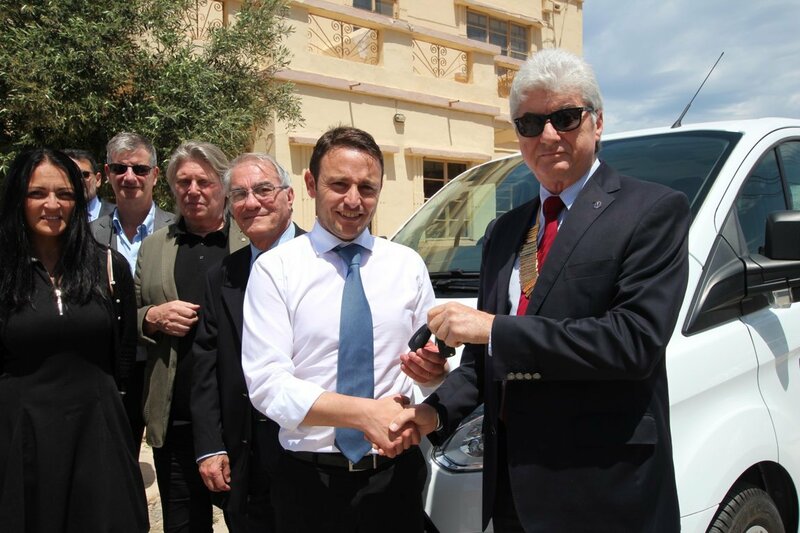 The hand over of the keys was made to the Director of Caritas Leonid McKay, also present were members of the Rotary Club Malta fund raising committee, and officials from Caritas and residents from the Prison Inmates Programme for which the van is to be used for. A very successful 'Rotary Hands-on Day' was held on Saturday April 23rd at Fondazzjoni Wens' Assisted Living apartments in Paola, when nearly 50 volunteers contributed to making improvements to the new home. This was the 8th edition of the Rotary Hands-On Days through which Rotarians and friends contribute with their hands rather than just with their cheque books. Rotary Club Malta is holding another in its series of Rotary Hands-On Days where we organise a day of hands-on service within our community. This year Rotarians and non-Rotarians alike, together with their families and friends, will gather at the Fondazzjoni Wens' Assisted Living apartments in Paola. Fondazzjoni Wens provides assisted and supervised living facilities for people with disabilities allowing them to continue to live within the community. "We are approaching the day when we will be celebrating the Jubilee of Rotarians, on 30th April 2016. This is a very special event organised by Rotary District 2080 and the Vatican. We will join his Holiness Pope Francesco for Holy Mass in St Peter's square, where 8000 seats were reserved for Rotarians, their family and friends. One of these places can be your visa that were extended deadlines for registration. To join us in this memorable celebration, visit the website of the Jubilee of Rotarians and register today without delay. The extraordinary Jubilee proclaimed by Pope Francis represents an appeal to undertake to serve humanity with joy and peace throughout the world. This event is indeed a great honor that will elevate the status of Rotary worldwide and the opportunity to take part in it is great joy regardless of our religious beliefs. As you continue to practice our motto "be gift in the world" I hope to meet you in Rome." Click here for more details about the Rotary Jubilee. There were two hundred and forty Rotarians and Guests who wined and dined at the Annual Gala Dinner held at the InterContinental Hotel in St Julian's on Friday April 1st in aid of providing a new minibus to Caritas. With the activities throughout the evening the Rotary Club Malta were able to present to the charity their new minibus at the end of the evening. The main event of the evening was an auction of paintings that were donated by the artists and when the auctioneer Frank Salt had completed his work the amount of €8,500 had been donated to the fund. There were other activates including a raffle and a 'Hands and Tails' game which further added to the donation fund.We would like to thank Edwards Lowell Co.Ltd who generously donated a Raymond Weil Ladies Watch as the prize for the raffle. The evening finished with dancing to the popular local band Red Electrik, and the event raised in excess of €26,000. The President and his wife Carmen were guests of Honour at the Inner Wheel Annual Lunch. It was held at Scoglitti Restaurant down by Jews Sally Port and was attended by about 30 members and partners. The President of the Inner Wheel Diana McNamara gave a speech also thanking Rotary for the kind donation of €500. The Annual Quiz night was held at the Ta'Xbiex Waterpolo Restaurant on February 22nd. 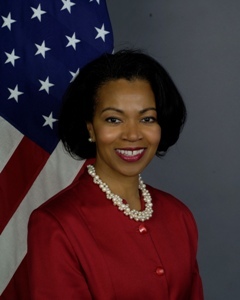 The United States Ambassador to Malta, H.E. Gina Abercrombie-Winstanley, addressed a meeting at Rotary Club Malta this evening. Madam Ambassador shared her views on Malta-U.S. relations and then opened up to broad range of questions from the members and guests. Thinking of the poor at Christmas. Fr. Hillary of the Millenium Chapel in Paceville, thanked all members of Rotary Club Malta for their Christmas presents of Rotary rucksacks, filled with Christmas goodies, which will be distributed to poor local families supported by Fr Hillary. 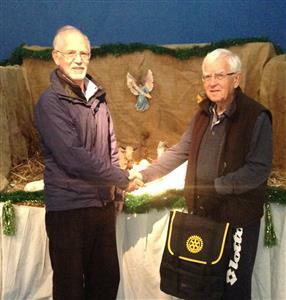 Club Secretary Mark Pullicino delivered the gifts on behalf of Members. Representing civil society and Global Polio Eradication Initiative partners, President Ravindran joined UN Secretary General Ban Ki-moon and heads of government from Commonwealth member states including Pakistan, Nigeria and Australia in committing to continue efforts to end Polio. The event was hosted by Malta’s Prime Minister and CHOGM Chair Dr Joseph Muscat. The Rotary Clubs of Malta are pleased to announce the launch of their annual scholarship for international, post-graduate studies which is valued at US$30,000 and open to Maltese residents. The purpose of the Rotary Scholarship is to enable candidates to further their post-graduate studies in areas of study which are aligned with the Rotary Foundation's Areas of Focus. The closing date for applications is the 18 December 2015. Rotary International President K R Ravindran starts a five day visit today to Malta, as a guest of the Maltese Government, to speak at the biennial Commonwealth Heads of Government Meeting (CHOGM). 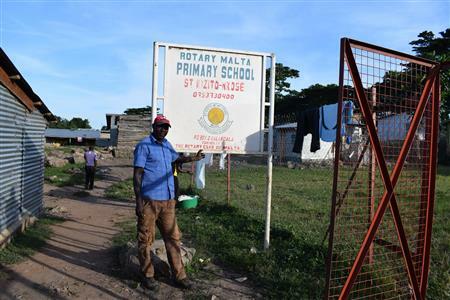 Rotary Club Malta inaugurates the new Rotary Malta Primary School in Uganda on Nkose Island in Lake Victoria together with funds from the Maltese Government’s International Development Aid and Kids of Africa (KOA), a Swiss based NGO based in Bwerenga. The project, which cost over €85,000, provides previously unavailable formal education to the 300 children living on the island and consists of classrooms, dormitories, kitchen and dinning areas and washing facilities. Rotary Club Malta has completed a project to provide the waterproofing of the facilities at the Inspire Foundation's facilities in Marsascala at a cost of 15,000 euros. Inspire is the leading facility providing services for people with disabilities and facilitating inclusion in our communities. Rotary Club Malta held its annual Golf tournament where Rotarians and their families from Sicily, Italy, Netherlands and Sweden joined Rotarians from Malta in a weekend of fun and fellowship between the 23-25 October 2015.. Thirty participants competed during the tournament held at the Royal Malta Golf club. Six members of Rotary Club Malta, accompanied by their wives, attended the meeting of the Inter-Country Committee (CIP) Italy - Switzerland - Malta - San Marino - Liechtenstein held between the 10th and 13th September in Leichtenstein. One of the three Maltese students, recipients of Rotary Grants this year, which will support international post-graduate studies, has just started her course leading to a Masters in Cognitive Behavioural Studies at the University of Buckinghamshire in the United Kingdom. Rotary Club Malta has traditionally placed great emphasis on the Rotary scholarship programme through which a grantee is supported to the tune of $30,000 funded by the Rotary Foundation. Rotary Club Malta is organising a visit aboard the Celebrity Silhouette luxury cruise liner on Thursday 15th October, with a tour of the ship and lunch aboard. The event is being organised as a fund raising event towards our club's ambitious targets. The event is open to friends too. Click here to read more about the event and for on-line or off-line registration. On the 11th August, Nigeria and Africa will be celebrating a full year without any new cases of polio. Just over a quarter of a century ago, the virus was endemic in 128 countries, crippling 350,000 children a year. We in Malta have also been scared and have had cases of this terrible disease. “This is a disease that cannot be controlled, it has to be eradicated, said WHO spokesman Oliver Rosenbauer. There are now only two countries left, Afghanistan and Commonwealth country, Pakistan, which still get a few cases of polio. Once polio is wiped out, it will be only the second disease, after smallpox, to have been vaccinated out of existence. There are now only two countries left, Afghanistan and Commonwealth country, Pakistan, which still get a few cases of polio. The Prime Minister Joseph Muscat and all the Maltese MEP’s from both parties have pledged their support to this campaign. It is hoped that the CHOGM conference, being held in Malta later this year, will highlight the Commonwealth’s commitment to finish the job and work to get the last two countries, and the world, polio free. Once polio is wiped out, it will be only the second disease, after smallpox, to have been vaccinated out of existence. The fight in Nigeria has not been easy. For more than a generation, Rotary has led the drive to eradicate polio, administering vaccinations to 2.5 billion children in 122 countries at a cost of $1.4 billion. Rotary Clubs in Malta have been playing their part over the years, in collecting and donating funds to Rotary International, for this noble cause. 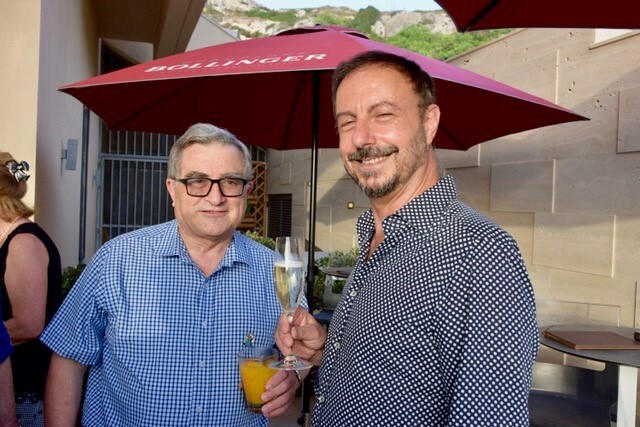 The President of Rotary Club Malta, John Cooper, and his wife Carmen hosted Rotarians and their friends for a most enjoyable and successful fundraising BBQ at their home in Attard. Early indications show that over €3,700 were raised through the event and the sale of raffle tickets. Over €3,700 were raised at the first fundraising activity of the new Rotary year during a very enjoyable BBQ held at the home of President John Cooper and his wife Carmen on Friday 31 July 2015. Over 130 Rotarians, their partners and guests were entertained to a delicious BBQ meal with lovely live music. 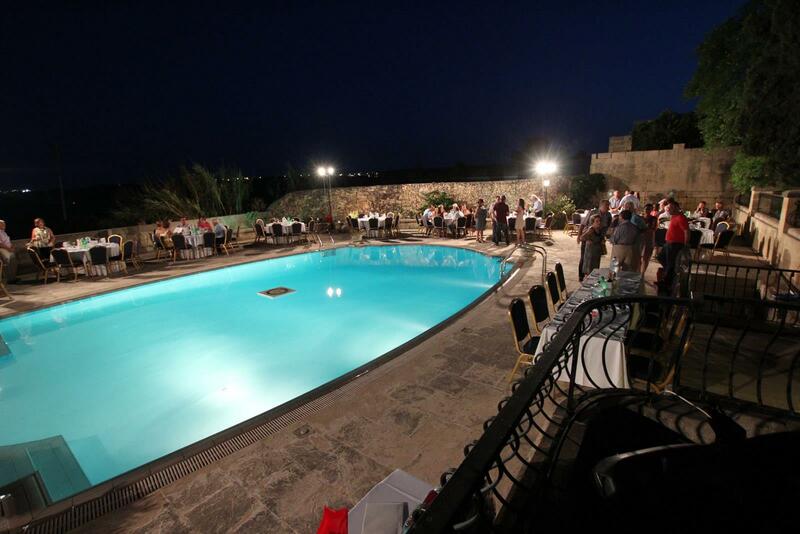 Photos of the Rotary Club Malta Summer BBQ event can be seen on Rotary Club Malta's photo gallery. The 2015 Rotary Kontiki race, a fund raising event now in its 4th edition in aid of Dar il-Kaptan, was held today in Balluta Bay, St Julians with 5 participating corporate teams from Corinthia Hotels, Elmo Insurance, Frank Salt Real Estate, Intercontinental Hotel Malta and Shireburn Software. Each year the teams have learnt from their designs and this year the boat from Shireburn Software was unbeatable by a long distance. 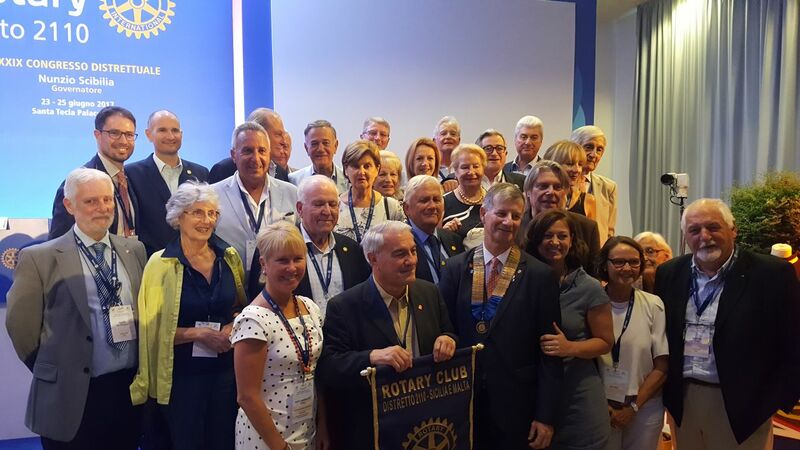 The 1st July always marks the start of the new Rotary Year and, as occurs in Rotary Clubs all over the world, Rotary Club Malta inaugurated a new President to lead the club. John Cooper, a long-standing Rotarian took over the helm at the Presidents' Hand-Over Dinner held on the 30th June 2015. 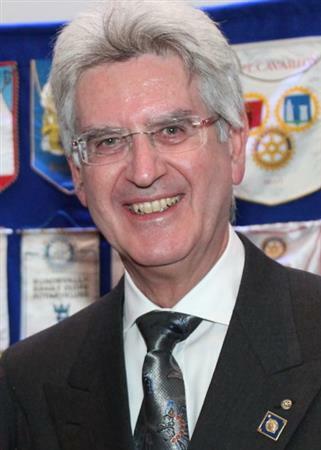 Rotarian Salv Stellini's interesting talk last Monday 22nd June was about personal accounts of WW2 he had received while preparing for the George Cross commemorative Medal, which was issued while he was the Maltese High Commissioner in London. This talk completed a line of interesting talks throughout the year, organised by Ulli Salomo and Alfred Caruana Galizia. Ulli has been bringing us varied and interesting personalities, now, for three years and the topics are as fresh and interesting as ever. Many thanks to Ulli and Alfred. The AGM of Dar il Kaptan, the respite home for the disabled in Mtarfa with which Rotary Club Malta has been so closely involved in supporting since its inception, was held yesterday, where several Rotary Board members attended. It was announced that the extension project, which commenced last November, had almost been completed. Construction work had been completed in April 2015 and a final push for completion of the finishing second was currently under way. Rotary Club Malta are the main funders of this much needed project. The AGM thanked Rotary for their continued support and interest in their charitable organisation. Much thanks also goes to the extension project architect Rotarian Nicky Samut Tagliaferro, who skillfully brought the project in below budget. The Prime Minister's wife, Mrs Michelle Muscat, President of the Marigold Foundation, who also supported the project, was present at the AGM. Rotary Club Malta would also like to thank Paul Sutana for all his good work representing the Club on the Board of DIK, over several years. 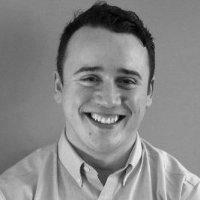 This volunteer position is being taken by Rotarian Tonio Cuschieri, and we wish him all the best. he campaign for the global eradication of Polio, founded by Rotary International in 1985 and subsequently joined by strategic partners, the World Health Organisation, UNICEF and the Centre for Disease Control, has made massive strides in its noble objective. While over 380,000 people were infected this disease annually, in 2014 the number was just over 400 globally and up to March 21st 2015, there had been 20 cases, 19 of which were in Pakistan. Eradicating the last 1 % of polio cases is difficult and costly, yet achievable by 2018 thanks to global efforts. As proven by recent outbreaks, no country will be safe until all countries are free of polio. The Global Polio Eradication Initiative has lobbied for the presentation in the European Parliament of a cross-party, non-political Declaration 008/2015 dated 9 March 2015 which urges the European Commission to make a continued commitment to supporting polio eradication as a priority in its future development actions, and to allocate appropriate levels of funding to polio vaccination campaigns and surveillance over the next four years. Ian de Cesare reported that the lobbying of the Maltese MEP's had resulted in getting all six on board, to support the Polio erradication campagin. Rotary Club Malta is once again holding its annual Kontiki Challenge in aid of Dar il Kaptan in which Corporations, Clubs and Groups of friends can participate in a challenge to design and build a homemade craft that will be used in a regatta that will be taking place in Balluta Bay on Saturday 11 July. This annual event is great fun and serves as a great team-building, competitive event. 7 teams are already registered. Read more about the event and sign up a team to take part. Rotary Club Malta is funding the restoration of a Giuseppe Cali (1846 - 1930) ceiling fresco in Lija Parish Church. The painting is one of a famous collection on the ceiling of the Lija Parish Church. The video (see Facebook below) shows the already restored Cali fresco's in the centre ceiling and then focuses on the one unrestored Cali fresco on the right wing ceiling. Rotary serving our cultural heritage. The Rotary Clubs of Malta and Gozo have awarded two scholarships, each worth US$30,000, for post-graduate, international studies to Maltese students. Students from Malta and Gozo compete with others from Sicily for the two scholarships which are funded annually by Rotary District 2110, Sicily and Malta. While usually, candidates from Malta win one of these scholarships with the second being awarded to a candidate from Sicily, this year, both District scholarships were awarded to candidates from Malta. The generosity of members was again demonstrated when we gathered a total sum of €8000 together with previously collected funds, for the Nepal Disaster Fund . THe money will be allocated by our Rotary Club in Kathmandu. Should members require more information please contact Francis our treasurer. Rotary Club Malta has held the seventh Rotary Hands-On Day on Saturday 30 May at Inspire, the foundation for inclusion, in Marsascala. Rotarians from the club, Interactarians from Interact Club St Edwards College and friends gathered to clear, clean and tidy the outside garden area which is enjoyed by the clients of Inspire. This is the last month of our Rotary Year - see what we have done in the past year, below. Our motto - "Building Bridges". The handover dinner from Alfred Caruana Galizia to John Cooper will take place on Tuesday 30th June. Give us your ideas for the coming year.
" To show our respect and help restore their dignity"
President Alfred Caruana Galizia , said during a presentation of presents inside a rucksack to all Migrant children in two homes in B'Kara and Fgura. A football, watch and illustrated dictionary, were some of the preferred gifts. This was part of a district wide initiative, covering Sicily and Malta which was instigated by the Rotary Governor Giovanni Vaccaro. One of the many activities that the Rotary District for Sicily and Malta have carried out this year to highlight the problems and issues of the migrant crisis. It has been one of the main focuses of the Governorship. The many people who helped gather the presents and put the initiative together were thanked by Dr Caruana Galizia. 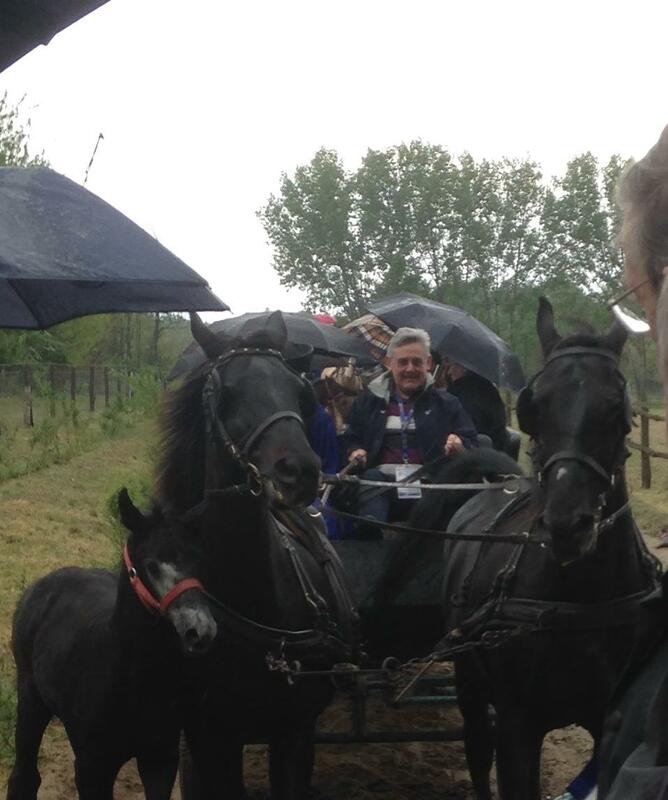 Rotarian Francis Camilleri holds the reins and keeps cool control of these frisky Hungarian thoroughbreds. This visit to a farm for stud horses outside Budapest was one of the many highlights of this most enjoyable four day trip. Janos Stein and President Ferenc Bancsics of RC Budapest Margitsiget, organised a memorable programme which included visits to the Parliament, a concert, dinner boat trip on the Danube and many fine meals. Alfred Mangion, past Governor exchanged flags with the Hungarian District Governor and the Club President, and thanked the hosts for the memorable visit. It was hoped that the event would be repeated by other clubs in the future. 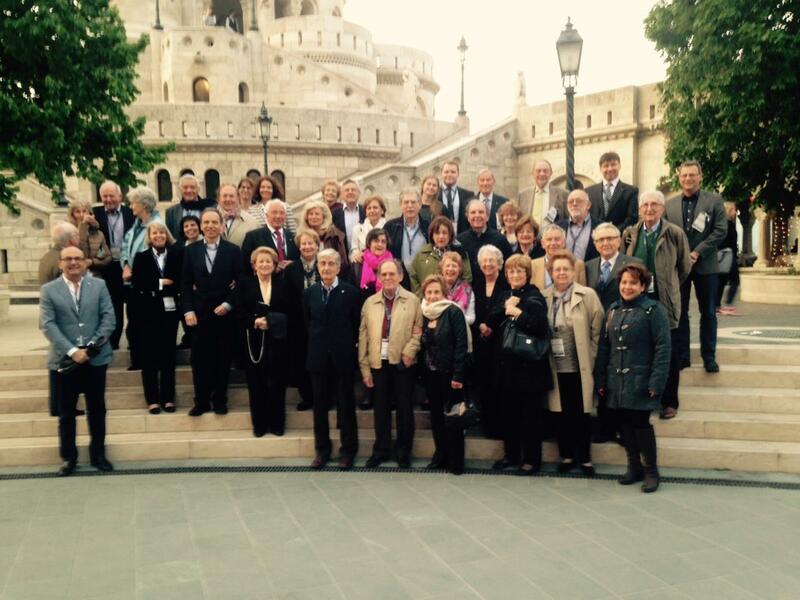 The 20 strong group from Malta were joined by another 20 Rotarians from Vienna, Germany. Slovenia and the UK. All were most impressed at the grand scale and beauty of Budapest. The Hilton Hotel on the top of Buda in the heart of the old town was excellent accommodation for the 4 days (1 to 4th May). Simon Bonello kindly coordinated the trip arrangements. Rotary Club Malta will once again be holding another of its Rotary Hands-On Days this time at Inspire in Marsascala on Saturday the 30th May 2015 where its volunteers will carry out a major maintenance and refurbishment of the garden area enjoyed by the children cared for at this institute. Come along Rotarians and friends to lend a hand in what is always a great day out of hard work, camaraderie and satisfaction. Learn more about our Rotary Hands-On Day at Inspire. 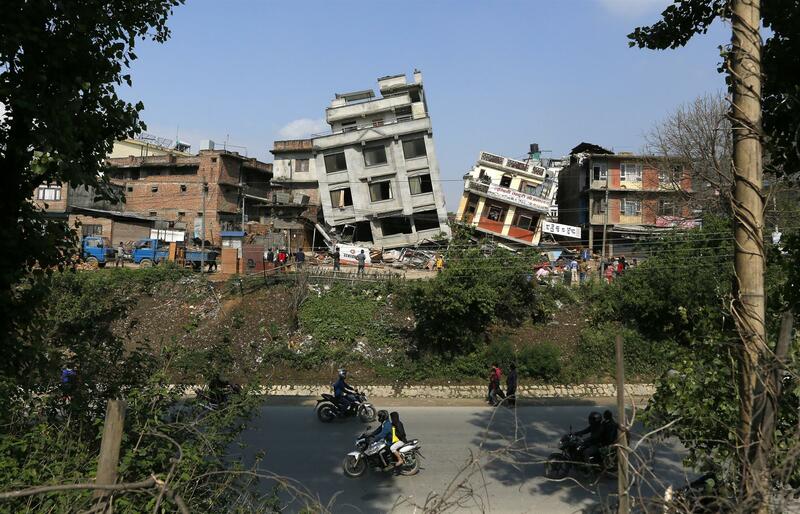 Rotary Club Malta launches an appeal for their NEPAL EARTHQUAKE DISASTER FUND. We are asking members and friends to donate towards an earthquake fund, such as we have done in the past for the Pakistan earthquake, the tsunami and Izola in Italy. The most iconic architectural symbol of the Maltese culture is our balcony, which in the upcoming 2017 Valletta European City of Culture, will be shown at its best. Rotarian Adrian Strickland's research has received much acclaim and his talk will be the topic of our Speakers Evening on Monday 20th April 2015. Rotary Club Malta's Annual Fund Raising Gala Dinner held on April 10th 2015 at the InterContinental Malta was another great success with over 280 Rotarians and guests. A very enjoyable evening in great company, good food and music and all for a great cause. Rotary urges Rotarians to lobby their Euro MPs to sign declaration 008/2015 of the European Parliament that exhorts the European Commission to make a continued commitment to support the global eradication of polio. Improving Rotary's visibility through the Social Media presence of Clubs was the topic of a workshop organised for all Rotary and Rotaract Clubs in the Maltese Islands and held at Shireburn Software on the 5th March 2015. The practical workshop exposed the participants to techniques for writing for the media, search engine optimisation, social media tools and management and the guidelines for the usage of the Rotary brand. This promises to be a memorable Rotary event. Rotary International today celebrates the 110th anniversary of its foundation. Founded in Chicago in 1905, Rotary is present in almost all countries of the world with over 1.2 million Rotarians carrying out service in their communities. The three clubs in the Maltese Islands play their part punching above their weight and have raised nearly €2 million through fund raising, grants and donations which have been put into our communities mainly in Malta but also overseas. 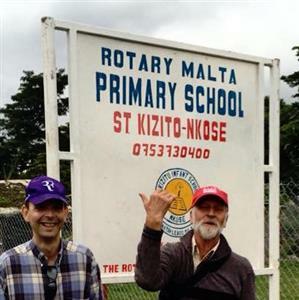 The Rotary Club has existed in Malta for 48 years. Rotary Club Malta is pleased to announce that its highly successful annual fund-raising dinner dance will be held at the InterContinental Malta Arena Conference Centre on Friday 10 April 2015. This event which usually draws over 300 people, consists of an evening of excellent food and flowing wine accompanied by great dancing. The success of this event can be seen in the number of repeat attendees both Rotarians and non-Rotarians and the companies that choose to sponsor the event annually. The Annual Rotary dinner is this year in aid of the extension at Dar il-Kaptan,the respite home in Mtarfa, work on which commenced in November 2014 at a projected investment of €100,000. 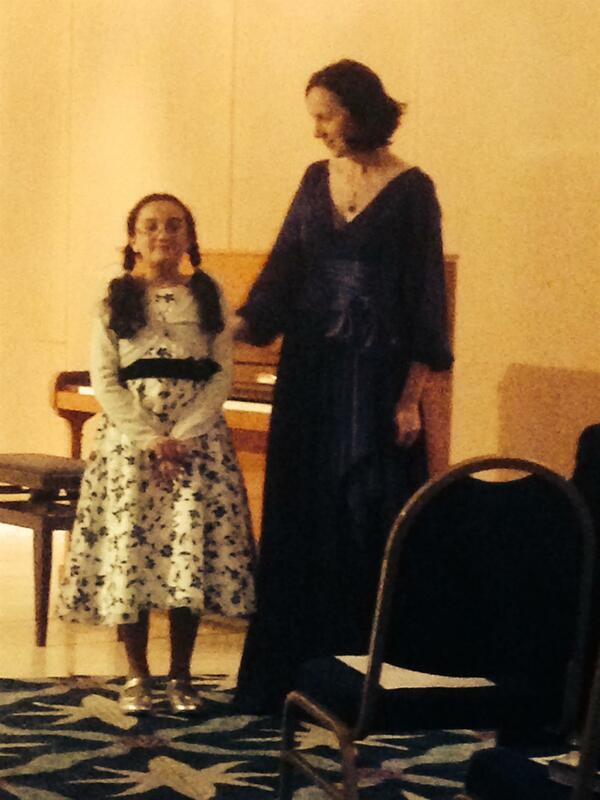 The audience were treated to a most enjoyable piano recital by Irina Fedcenko - Carbonaro and two of her pupils , Amy Borg(8) and Daphne Delicata (12). Beethovens "Moonlight" Sonata op 27, had never been so moving, as were the other pieces by Chopin, Brahms, Rachmaninov, Toccatta and Heller. Several encores were played to the delight of the 50 strong Audience. The maturity of the music played by the young musicians was remarkable. Rotary endeavors to foster young talented musicians and the event gave ample opportunity. Event Chair Frank Salt, said that it must have been one of the best music recitals that the club had put on. The Corinthia Hotel kindly provided excellent canapes to start the eventing, which ended with dinner at the Caviar and Bull restaurant. A great Rotary cultural eventing. President Alfred Caruana Galizia thanked the musicians for their deightful performances. 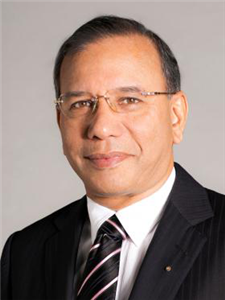 Every new Rotary year, commencing in July, has a theme and Rotary International President-elect K.R. “Ravi” Ravindran asked Rotary members to use their talents, expertise, and leadership to transform the lives of others when he announced his theme for the 2015-16 year, Be a Gift to the World, during the International Assembly in San Diego, California, USA. 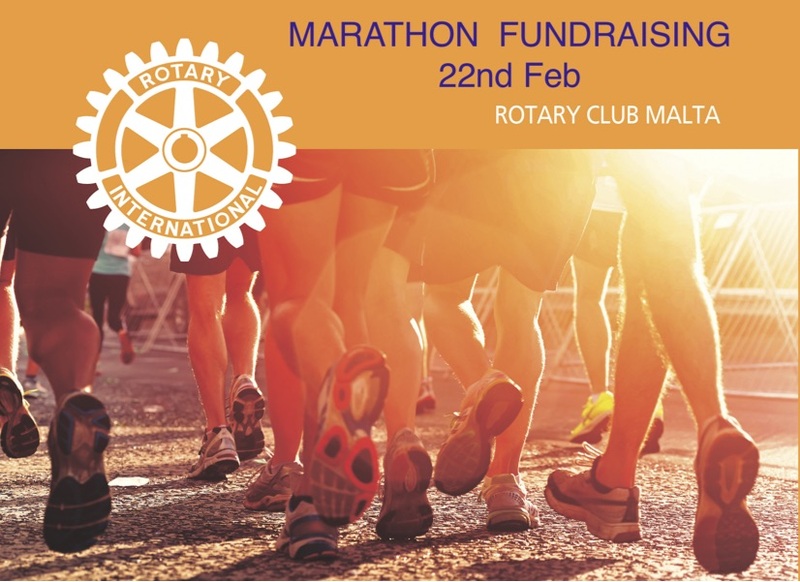 Come and join the Rotary Malta Club Team - Fundraising in the Marathon or the Walkathon onSunday 22 Feb. Contact Mark Pullicino for details and sponsorship forms. 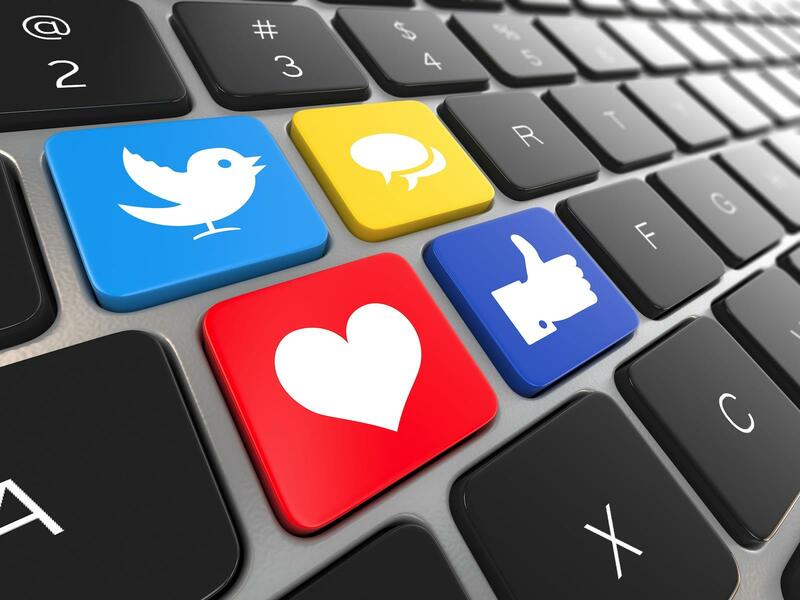 Rotary Club Malta is organising a workshop for all Rotary and Rotaract Clubs in Malta and Gozo to assist them in leveraging the power of the Internet and Social Media to promote the visibility of their Clubs. One of the challenges of Rotary clubs around the world is to broadcast the message about their values, their projects and the work in the communities they serve. This workshop will assist the Clubs in being more successful in communicating their work and impact in the community. Rotary Club Malta is holding a piano recital by Irina Fedcenko-Carbonaro at its meeting of the 2nd February 2015. Members and friends are invited to attend. The recital will be followed by a dinner. The Rotary Clubs of Malta and Gozo are pleased to announce the launch of a scholarship for international post-graduate studies valued at US$30,000. The purpose of the Rotary Scholarship is to enable candidates to further their post-graduate studies in areas of study which are aligned with the Rotary Foundation's Areas of Focus. The closing date has been extended to 25 January 2015. EUROS 35 - INCLUDES FILM, DINNER, AND PARKING. Send cheques to Francis Naudi. Frank Salt's 70th birthday had a double celebration. Besides his party he kindly collected donations (instead of presents) for Dar il Kaptan. Here he is seen with President Alfred Caruana Galizia presenting the donation. The president also gave a generous donation to Dar il Wens, during the District Governors Gala Dinner on December 6th. 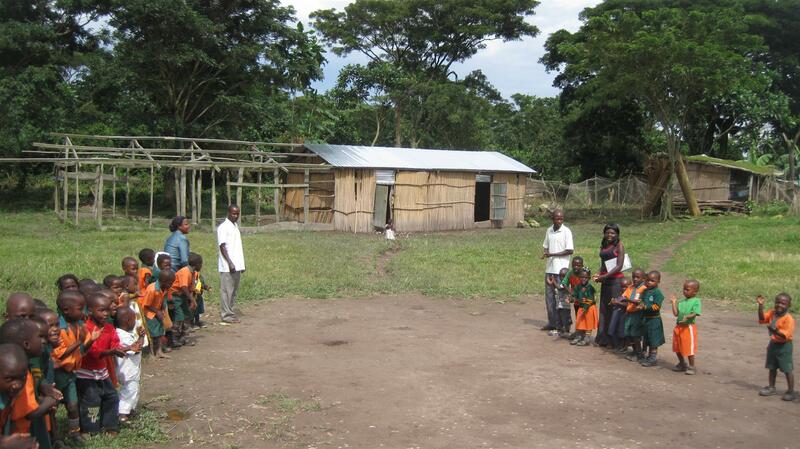 Work is well underway for a new school in Nkose Island in Lake Victoria, Uganda. The children are egarly awaiting to move into the classrooms, which are being built by local craftsmen, using partly local materials. Our partner "Kids of Africa", who have their main school just across the water on the main land in Entebbe, is supervising the plans and construction and will also see to the operation. Funding is being provided by the Malta Government NGO funds together with Rotary Club Malta funds. More information from Ian de Cesare. 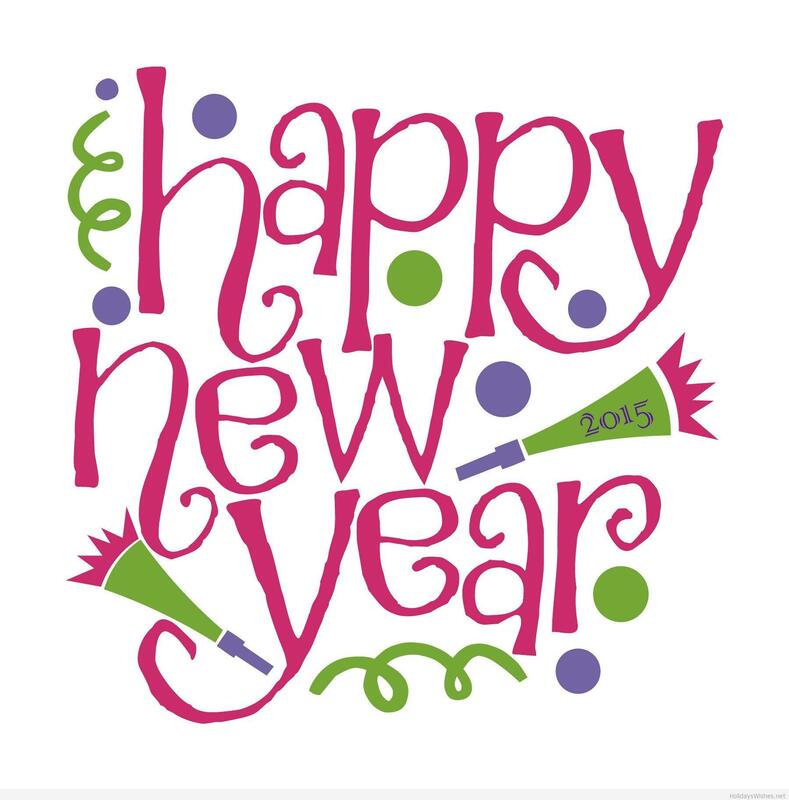 We wish all Rotarians all the best for the New Year 2015. The year finished with the successful social events of the more formal Governor's Gala Dinner in the Verdala Palace, followed by the less formal and most enjoyable Ladies Night, at the Portomaso Club 22. A full social programme will continue into the New Year, with the first meeting, on 5th January, being the Member's Speaker Night, where 3 members will be giving us short talks. Stephen Mangion on "Camino di Santiago de Compostelo". Frank Bonello on his interesting "experience as a banker". and Albert Cillia-Vincenti " Diet and Lifespan". Its perhaps a good time to briefly reflect of all we have been doing as a club over the past year in the area of PROJECTS, PEACE INITIATIVES, FUNDING EVENTS, DONATIONS and we look forward to all the fun events we will organise in the New Year and opportunities to get to know our fellow members better and be even more effective in serving the community. The next fundraising event on our calendar is the Malta Marathon and Walkathon, which isbeing held on February the 22nd. Please register on the Malta Marathon Website - www.maltamarathon.com and indicate that you are from Rotary Club Malta (it is included in the dropdown menu). The Gala Dinner Fundraiser, our main fundraising event of the year will also take place in May (provisionally the 8th of May). These events follow onto the events held in 2014 - The Kontiki Challenge, held in July and the November "Artists for Charity Exhibition" . The joint peace scholarship was set up to study Israel Palestinian Peace. An Israeli and Palestinian post graduate students have been given the chance to come up with solutions to our od Mediterranean conflict. The Mediterraneo Unito Conference in Marsala in September brought countries from around the Mediterranian to discuuss our joint problems and look for solutions. San Marino, Hungary, the United Kingdom and Malta joined Rotarians from Rotary Club Malta for the highlight of the Comitato Inter-Paese (CIP) meeting, which discussed peace issues. District Governor 2014-2015, Giovanni Vaccaro, today visited Dar il-Kaptan, the respite home in Mtarfa which has been a long term project of Rotary Club Malta. The Governor was accompanied by District Secretary, Santo Spagnol, and members of the board of Rotary Club Malta, lead by President Alfred Caruana Galizia. Three Sicilian Jazz musicians thrilled audiences at the Rotary fund-raising Jazz concerts held in Catania and Palermo on the 22nd and 23rd November, organised by Rotary District 2110, Sicily & Malta. Speaker Night Monday 10 November, The Corinthia St Georges. Rotary Club Malta President Alfred Caruana Galizia outside the Presidents Verdala Palace. Rotary Club Malta's Charter Night, together with the reception held for the District Governor, Giovanni Vacarro, on the occasion of the Governor's official annual visit to our club, will be held at Verdala Palace on Saturday 6th December at 7.30 pm. We are fortunate to obtain this fabulous venue which seats 100 people. Details to be announced later. Come and experience this open plan interior space and view paintings from artists including Mary De Piro, Jeni Caruana, Kenneth Zammit Tabona, John Borg Manduca, George Apap and Mark Pullicino. This start to the St Julians Winter social cultural activities should not be missed." It is a must to be seen there". MONDAY 17th November, 7.00pm at 4 Ivo Muscat Azzopardi Street, St. Julians. Partners and friends are welcome. After the exhibition walk down to the magical Spinola Bay where a special social menu has been arranged at the GULULU RESTAURANT by the waters edge. (A special price of €22 has been agreed, including wine). It is suggested that residents of St. Julians and Sliema walk to the venue. (See web site events for more details). Over the weekend of the 17th to the 19th October, the Malta Rotary Golf Fellowship entertained a group of Sicilian Rotarians, wives and friends at the Royal Malta Golf Club. 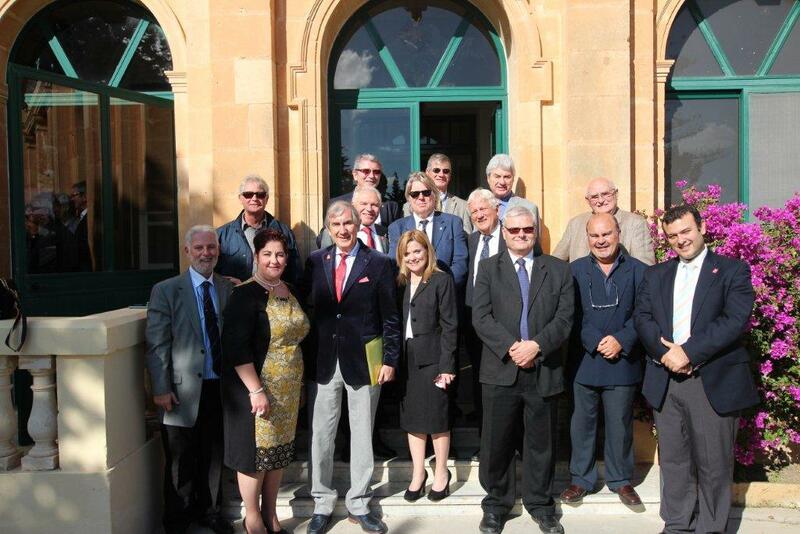 The Fellowship now boasts 18 members (14 from Rotary Club Malta, 3 from La Vallette and 1 from Gozo). In addition, close family are eligible to play and that increases our numbers by a further 5 if everyone was available. One of these "guests" is J.J. Micallef, Ulli Salomo's stepson, whose golf handicap is some 30 shots better than the average Rotarian! On the Friday, a Fun Team event was narrowly won by Ulli Salomo, Marlyse Cremers and JJ, from Ian DeCesare, Fillipo Alessi and Phil Stevenson. On Saturday, a pairs competition was once again won by JJ who carried Ulli superbly! In close support were 2 Sicilians and the Frank Salt/Ian De Cesare combo. Sunday was a singles event and 2 Sicilians both played well below their handicap to give them easy victories. At the Sunday prize giving (at which President Alfred did the honours) all 18 golfers present managed to win a prize by some administrative sleight of hand by Phil Stevenson. The overall winners of the competition, who won the Stanley Sullivan 100 year old golf club, were Ulli Salomo and JJ. The runners up were John Miller and Phil Stevenson. The next events for the Fellowship are at Donnafugata on November 29 th and at Verdura on 11th - 14th April. Our thanks to Phil Stevenson and Ian de Cesare for all the good work in organising this ever growing event. We learn to be dramatic before we learn to use language. Being human is the ability to see and play otherness. Empathy and relational skills are the ability to put oneself in another’s shoes, and see another’s perspective. That is drama! Thus healthy human beings who can engage in empathy and relationships are dramatic beings. Dramatherapy draws on theater skills such as role play, improvisation, imagination, masks and story work to facilitate developmental growth, and emotional and social healing. Dramatherapy is defined by the UK Health and Care Professions Council as a form of psychotherapy in which creativity, play, movement, voice, storytelling, dramatisation and the performance arts have a central position within the therapeutic relationship. 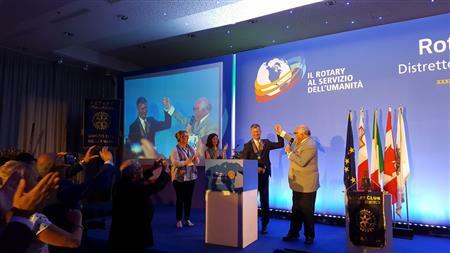 Rotarians from across the Mediterranean, including from Malta, gathered in Marsala, Sicily in October to discuss issues related to the Mediterranean region with a special focus on topics such as peace, conflict resolution and social development. Malta made a good showing with a presentation by Martin Xuereb, Director of MOAS. Alfred Caruana Galizia (President), Ian de Cesare (Assistant Governor), John de Giorgio and Annemarie Bianchi, (President of RC La Valette), all participated. An HSBC team of volunteers, Mr Glenn Bugeja and Mr Stephen Pandolfino, will talk about their experiences in Ghana. One of Rotary's areas of focus is 'Clean Water for all' so the talk is of particular interest to see how the projects are carried out.. Keep a note of the date Monday 27 October at 7.00pm. Ranier Fsadni a well known journalist and university lecturer is our Rotary speaker on Monday 6th October. His very topical subject is "Isis and the political situation in Syria and Iraq". Ulli Solomo who set up the talk said " You know we are all thinking what effect is all this going to have on us. Well we can find out in Ranier's talk. It will be very interesting." For more details click on "Upcoming Events". Over 100 visiting Rotarians from Switzerland, Italy, Liechtenstein, San Marino, Hungary, the United Kingdom and Malta joined Rotarians from Rotary Club Malta for the highlight of the Comitato Inter-Paese (CIP) meeting which was a Gala Dinner held at the Intercontinental Hotel last Saturday 27th. Delegates heard talks on international co-operation and also the Valletta 2017 programme. Over 100 visiting Rotarians from Switzerland, Italy, Liechtenstein, San Marino, Hungary, the United Kingdom and Malta joined Rotarians from Rotary Club Malta for the highlight of the Comitato Inter-Paese (CIP) meeting which was a Gala Dinner held at the Intercontinental Hotel last Saturday 27th. Delegates heard talks on international co-operation and also the Valletta 2017 programme. Simon Bonello the organiser was congratulated by the many guests. For details see " Events and dates " on the web site. Please share this email Newsletter with your friends. Thinking of that trip to Istanbul? Well we are invited by the Istanbul Rotary Club to a Conference on UNESCO Historical Cities on 3rd to 5th April 2015. Six teams today took part in the Rotary Kontiki challenge using home built sea crafts to follow a course in St Julians Bay. 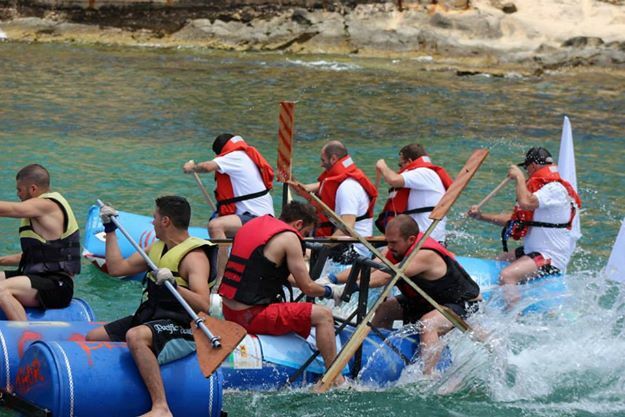 The teams paid to compete for this challenge and the money raised will go towards Rotary Club Malta's projects at Dar il-Kaptan. Visitors welcome to the Malta Conference. We are expectig 100 or so guests, the full programme can be viewed under events on the website. Local members will focus particularly on the dinner events organised on 25th, 26th and 27th of September. More details can be obtained from the Web (under events opposite). 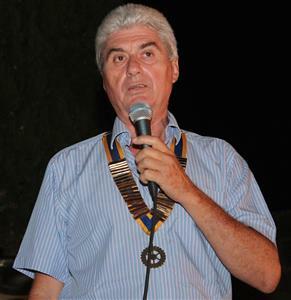 Simon Bonello, organiser of the event said " This is a great opportunity to meet other Rotarians from Malta, Italy, Switzerland, San Marino and Liechtenstein." We are bringing in a band from abroad to provide specially adapted music for the Saturday 27th's gala evening". A unique event that will focus on peace and goodwill and no doubt generate plenty of local interest among our members in this inter-country yearly meeting that is held in different locations of Italy and Switzerland. 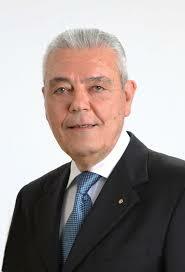 Dr Alfred Caruana Galizia has assumed the Presidency of Rotary Club Malta as of the 1st July 2014. Rotary Club Malta has launched its new web site designed to improve the features available both to members and non-members alike. The Spanish Ambassador to Malta received Madrid and Malta Rotary Clubs to discuss a joint project between the two Rotary Clubs to underline the common cultural legacy between Malta and Spain.